Tom Thibodeau, who was fired Jan. 6, held the dual role of president of basketball operations and head coach for 2 1/2 seasons, one game short of the halfway point of his contract. Layden stayed on in charge of the roster, and Saunders was promoted to run the team. Owner Glen Taylor said then he would evaluate Layden and Saunders over the balance of the season before determining whether they would return. "They worked through a season with many injuries requiring many challenges in our player lineup. We are incredibly grateful to them for all of their hard work and commitment to the franchise," Taylor said. 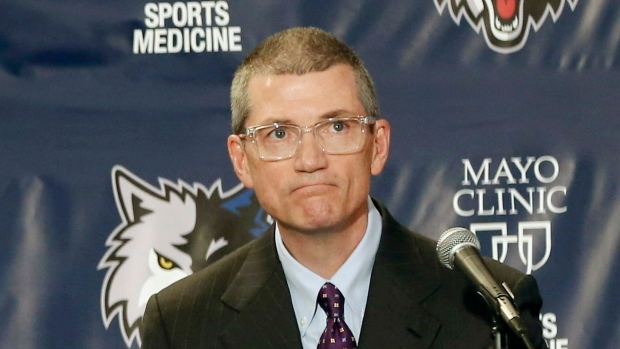 "The future of the Minnesota Timberwolves continues to be very bright. It's more important than ever that we find a leader who can build a successful team in today's fast-paced NBA. We have the cornerstones of a very talented team and need to assemble the final pieces that will elevate us into a playoff team and one that can compete for championships." "There's a lot of could-be, would-be last moments in anything, whether it be in sports, whether it be in life, you never know," Saunders said. "I've learned that over the last few years since going through some loss that you need to enjoy each moment." Saunders said the team's search for a new president won't affect the way he heads into the off-season, either. "It really does not change anything for me one bit. When I accepted this post in early January, I approached it as I'm the head coach until they tell me I'm not the head coach," Saunders said. "And that's how I continue to look at things moving forward." "I think we have a lot of things that are going in the right direction, I really do. And you look at some cornerstone pieces, you look at young players. We have a good situation here and ... these guys have competed as of late, and I think that's a big credit to the character that we have in that locker room."